Hi my darlings! I hope your week has gotten off to a good start! I'm still reveling in these precious summer vacation days off from work, when I have time to swatch to my heart's content! And swatch I have! Tonight I have the pleasure of introducing another new indie brand--this time, all the way from Hong Kong! Presenting Too Fancy Lacquer--a brand with a range of pretty holo polishes! Charlene (Carmen) and I were introduced to one another when she joined my Minions and Mini-Manis giveaway and I got a glimpse into her new releases! She sent me three for me to review and then I promptly bought three more (look for Part II) because her polishes looked too pretty not to be part of my stash! Both packages came super fast--I received them BOTH in less than 5 business days of placing my order! Talk about jet-speed! The first of the three I was sent for review is Distance and Time--a pretty, pastel light blue with a light holographic sparkle! 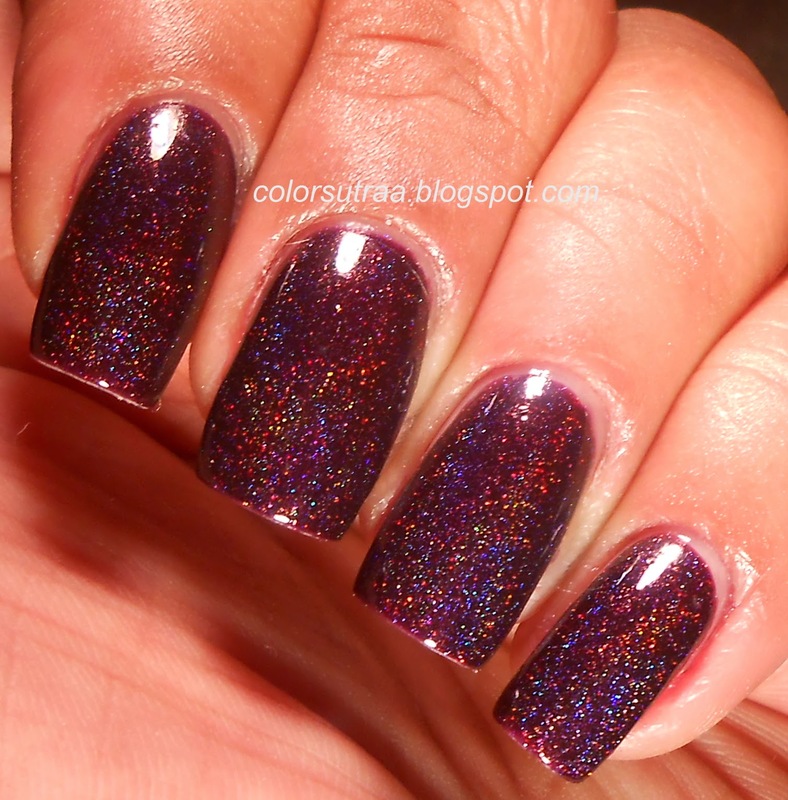 The application was smooth and I used 3 coats for the swatches below. 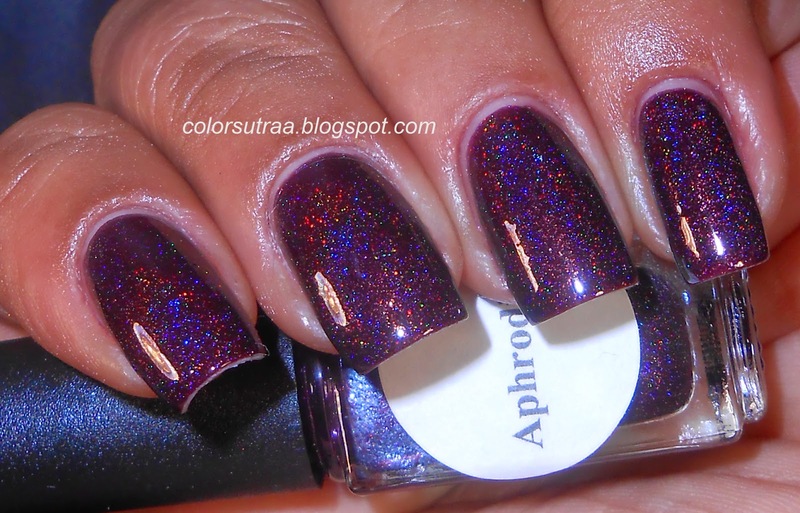 Next, I have Aphrodite--a rich, burgundy linear holographic polish! Once again, no issues with application and I used 2 coats for the swatches below. This polish was definitely my favorite of the three! Finally, I have Rendezvous at Azure--a gorgeous periwinkle blue linear holographic polish with pink shimmer! I had no problem with application and I used 3 coats of the swatches below. Isn't this lovely? So there you have it! 3 gorgeous holographic polishes from Too Fancy Lacquer which you can find HERE for $9.50 for a full-size, 0.5 oz bottle--she does ship world-wide! Not surprisingly, she's currently out of stock on almost all her polishes but you can follow her Facebook page OR follow her @toofancylacquer on Instagram to keep updated on all the restock information! Stay tuned for Part II of my Too Fancy Lacquer swatches! Thank you for the lovely review Babi!